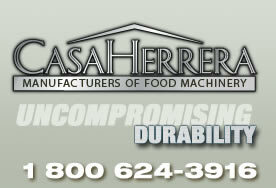 The Casa Herrera Die Cut system integrates a tri-roller sheeter that drops the dough to the flour covered conveyor, dough transfer conveyor, cross grain rollers to expand the dough sheet making the dough stronger, a set of flattening rollers to achive the desired thickness, a rotary cutter sized to your specifications, a rework return conveyor to recycle the excess dough into the tri-roller ssheeter hopper. 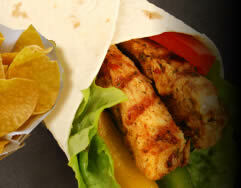 It delivers a large quantity of diferent size and shape tortillas into the Herrera energy efficient Odyssey oven. 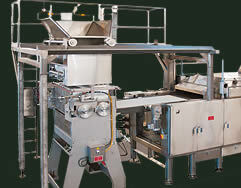 Provides a continuous ribbon of dough to the sheeting system. Two (2) 8” Diameter stainless steel extrusion rolls – stationary. One (1) 8” Diameter stainless steel extrusion roll – movable. 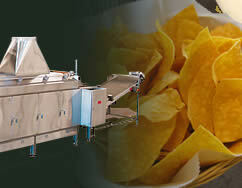 Stainless steel frame and hopper. SCR/DC variable speed drive and gear motor. Flow adjustment tabs across conveyor. Stainless steel hopper and frame. Portable “C” frame tall mount. Stainless steel sanitary type legs with adjustable feet. Reduces dough thickness 90° to the direction of dough travel. Stainless steel frame and guards. ¾ HP gear motor drive. Manual height adjustment with dial indicator – Calibrated in Millimeters. 10 Ga. Stainless steel conveyor bed. Endless conveyor belt; monofilament; FDA Approved. Ramp up to match oven in-feed. Removes excess flour from the top of the dough sheet. Triple blade brush assembly with auger side discharge. Housing for cutter to cut product into desired sizes. Pneumatic adjustment control of position and cutting force. 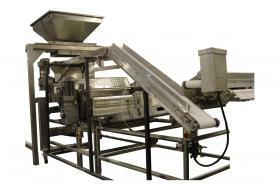 Picks up scrap dough web and deposits it on cross conveyor. Conveyor belts: Woven Polyester; FDA Approved. Pick-up conveyor drive: Variable speed drive and gear motor. Transfer conveyor drive: Constant speed drive and gear motor.